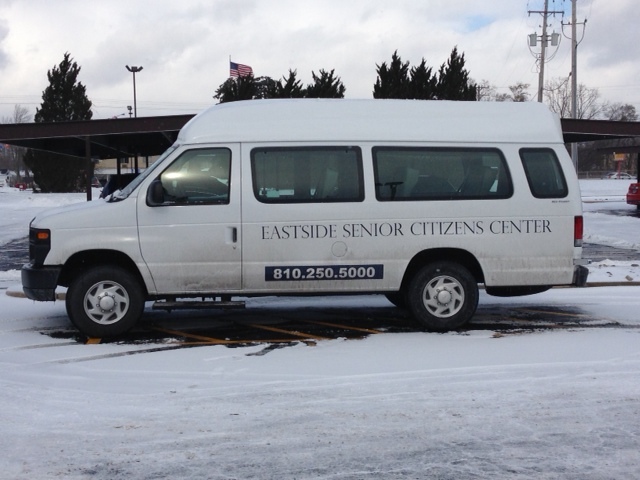 Eastside has a new van! One important goal at the senior center is to keep our seniors safe, and many of our programs and services are designed to do just that. Surveys, questioners, and evaluations always indicate that transportation is one of the major concerns for many senior citizens. Having said that, we hope you consider our transportation program should you ever be in need of this service. One really nice thing about our transportation service is that it is door through door which means you are picked up and dropped off right at the front door which eliminates the headache of searching for a parking spot, scraping windows and fighting snow, ice and rain! It also helps prevent you being involved in a crime or a slip and fall on ice or snow. And if you require some assistance, our driver is trained to help you. Who wouldn’t appreciate that? In closing, if you find yourself in need of our transportation services, or simply don’t want to fight traffic or hassle with trying to find a parking space, consider leaving the driving to us! The Senior Center has transportation available for those 60 years and older. Private rides are available to the pharmacy, doctor appointments, and to and from the senior center. Please note: There are a few restrictions relative to age and geographic location. For additional information including pricing and scheduling a ride, please call: Kearsley Daly Villa Office 250-1000.